Arcangelo Corelli was born in Fusignano, Italy, on 17 February 1653, the youngest child of a wealthy landowner. His musical studies took him first to the local towns of Faenza and Lugo, and then, when he was about thirteen, to the nearby city of Bologna, one of the most important musical centres of the time. Corelli lived in Bologna, studying the violin and composition with local musicians, until he was about twenty when he seems to have settled in Rome. He is first recorded there in 1675 as a junior member of a Lenten oratorio orchestra. Corelli’s progress in Roman musical society was rapid. By 1679 he was playing a prominent role in ad hoc church orchestras, and had entered the service of the most glamorous patron of the time, the exiled Queen Christina of Sweden. His first published collection, his Opus 1 trio sonatas, was dedicated to Christina. As far as we know, Corelli remained in Rome for the rest of his career, though stories circulated in the eighteenth century that he had travelled to Germany, France, Spain and even England—he supposedly reached Rochester on his journey to London when he heard that Henry Purcell had died, whereupon he returned home! 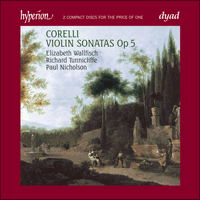 Corelli was immensely influential in northern Europe from the 1680s onwards, but in reality he was known almost exclusively through his published collections: three subsequent sets of trio sonatas, Opp 2, 3 and 4, appeared in 1685, 1689 and 1694, and they were followed by the subject of this recording, the Sonate a violino e violone o cimbalo, Op 5, of 1700. His last work, the Op 6 set of concerti grossi, was published in Amsterdam in 1714. Corelli died in Rome on 8 January 1713 and was buried in the Pantheon. Corelli occupies a crucial position in the history of Western music, not least because he is the earliest composer whose major works have never passed out of the repertory (and therefore have never had to be revived), remaining continually in print since they first appeared. Opp 1 to 6 continued to be reprinted in increasingly debased versions throughout the eighteenth and early nineteenth centuries until these were superceded by the 1871 collected works of Joachim and Chrysander, the first scholarly modern edition. Op 5 was undoubtedly the most popular of his collections. It was reprinted more than fifty times in the eighteenth century in ten European cities, and music from it appeared in many guises, ranging from simple adaptations for keyboard and recorder to Geminiani’s concerto grosso elaborations. Corelli’s sonatas achieved their enormous popularity in the eighteenth century in part because they presented the Italianate style of his time in its most polished and classic form. When Charles Burney visited Rome he was told that Corelli had spent three years revising and editing them for the press, and the example of Op 6 suggests that some of them go back to his youth. We know from his German pupil Georg Muffat that some of his concerti grossi were in existence by 1682. Similarly, he had composed at least one violin sonata by 1679, when he promised to send it to a member of the Florentine court. The fact that so little authenticated music by Corelli survives outside his printed collections suggests that he was concerned to allow only his best music to circulate, released only after repeated revisions. To judge from the many imitations written by northern European composers around 1700, the most influential element of Corelli’s style was his harmony. His sonatas popularized the idea, revolutionary then but commonplace to later generations, that movements should modulate in a logical pattern to closely related keys such as the dominant and the relative minor. The lack of such a scheme made the chamber music of even the best of his German and English contemporaries, such as Biber and Purcell, seem aimless and confused by comparison. Corelli also showed his contemporaries that modulations could be elegantly achieved by sequences moving up and down by step, and that sequences were the ideal framework for virtuoso passagework. Equally important, he popularized the use of biting dissonances to propel the music forward, typically over a running bass as in the fugue of Sonata No 1 or the Tempo di Gavotta of Sonata No 9. Again, English and German composers were familiar with sevenths and ninths, but tended to use them to colour the music rather than to give it direction. Corelli was less forward-looking in matters of form. Sonatas 1 to 6, commonly but misleadingly called ‘church sonatas’, still bear traces of the multi-section ‘patchwork’ designs of the early seventeenth century. All of them have at least five major sections, divided in the original edition only by double bars, and No 1 has no fewer than ten changes of pace in only six-and-a-half pages of music. Three of the so-called ‘chamber sonatas’ in the second part of the collection—numbers 7, 8 and 10—are simple suites, with three or four dances following an ‘abstract’ prelude; they are probably earlier than No 9, which has a chromatic Adagio between the Giga and the Tempo di Gavotta, and No 11, perhaps the last in the set to be written, which has only one named dance—a concluding Gavotta. Sonata No 12, the famous ‘Follia’ or ‘La Folia’, belongs to a tradition of violin variations on chord-sequences that goes back to the generation of Salamone Rossi and Biagio Marini. It has its origin in a wild sixteenth-century Spanish dance, and is related to the Renaissance ground bass ‘La Gamba’ which is essentially ‘La Folia’ minus the first chord. Later settings by composers ranging from Vivaldi to Rachmaninov were nearly all inspired by Corelli. An important element of the continuing popularity of Corelli’s Op 5 was the tradition of using it as a vehicle for improvised or written-out ornamentation. For information on this subject I am indebted to Neal Zaslaw who has prepared an edition of the surviving sets of ornaments. The most famous of them—florid versions of the slow movements of Sonatas 1 to 6—appeared in Amsterdam in 1710, when the publisher Roger claimed that they were ‘composed by Mr A Corelli as he plays them’. Some musicians were dubious about their authenticity (the English writer Roger North wondered how ‘so much vermin could creep into the work of such a master’), so Roger responded in an advertisement of 1716 by offering to show anyone who wanted to see them ‘Mr Corelli’s original, with his letters written on this subject’. Opinions have been divided on their merits ever since, but they certainly seem to be the sort of thing that a good Italian violinist of the time would have played, and they are largely followed on this recording. Later violinist-composers from Geminiani (a Corelli pupil) to Francesco Galeazzi (1758–1819) wrote ever more elaborate versions, and some began to write variations on the fast movements of Sonatas 1 to 6 as well as many of the movements in Sonatas 7 to 11. Two examples can be heard on this recording. The decorated repeats of the Preludio of Sonata No 9 come from Cambridge University Library Add MS 7059, an English source probably of the 1730s or ’40s, while Sonata No 9 is repeated in its entirety in the complete elaborated version by Geminiani, which was included in Sir John Hawkins’s General History of the Science and Practice of Music (London, 1776). Hawkins wrote that it was written ‘as Geminiani used to play it, and copied from a manuscript in his own handwriting’, adding that it was ‘the best specimen that can be given of the style and manner of his [Geminiani’s] execution’. Né a Fusignano, Italie, le 17 février 1653, Arcangelo Corelli est le dernier-né d’un riche propriétaire terrien. Ses études musicales le mènent tout d’abord aux bourgs voisins de Faenza et de Lugo, puis, vers 13 ans, à Bologne, grande ville de la région et l’un des centres musicaux les plus importants de l’époque. Corelli vit jusque vers l’âge de 20 ans à Bologne, où il étudie le violon et la composition avec des musiciens locaux, et part ensuite pour Rome; son nom y apparaît pour la première fois en 1675, en tant que membre d’un orchestre d’oratorio pour le Carême. Il progresse rapidement dans la société musicale romaine. Dès 1679, il joue un rôle de premier plan dans des orchestres d’église temporaires et entre au service de la reine en exil Christine de Suède, l’un des plus prestigieux mécènes de l’époque, à qui il dédie son premier recueil publié, les Sonates en trio Opus 1. Pour autant que l’on sache, Corelli passe le restant de sa carrière à Rome, bien que l’on ait raconté, au xviiie siècle, qu’il s’était rendu en Allemagne, en France, en Espagne et même en Angleterre, où, en route pour Londres, il aurait fait demi-tour à Rochester et serait rentré en Italie en apprenant que Henry Purcell était mort! À partir des années 1680, Corelli exerce une immense influence en Europe du Nord, mais on ne le connaît guère, en réalité, qu’au travers de ses œuvres publiées: trois nouveaux recueils de sonates en trio, Opus 2, 3 et 4, paraissent en 1685, 1689 et 1694 et sont suivis, en 1700, du volume qui fait l’objet du présent enregistrement: les Sonate a violino e violone o cimbalo, Opus 5. Son dernier ouvrage, les Concerti grossi opus 6, est publié à Amsterdam en 1714. Mort à Rome le 8 janvier 1713, Corelli est enterré au Panthéon. Corelli occupe une position clef dans l’histoire de la musique occidentale, notamment parce qu’il est le premier compositeur dont les principales œuvres se sont constamment maintenues au répertoire (sans qu’il soit donc jamais besoin de les redécouvrir), et qu’elles n’ont jamais été épuisées après la première parution. Les réimpressions des opus 1 à 6 se sont succédées, avec une baisse de qualité constante, tout au long du xviiie et du début du xixe siècle, jusqu’à ce qu’elles soient remplacées par la première édition moderne et musicologique des œuvres complètes, réalisée par Joachim et Chrysander en 1871. Indubitablement le plus populaire de ses recueils, l’Opus 5 a été réimprimé plus de cinquante fois au XVIIIe siècle dans une dizaine de villes d’Europe; il a donné naissance à de nombreuses œuvres dérivées allant de la simple adaptation pour clavier et flûte à bec aux concerti grossi de Geminiani. Si les sonates de Corelli ont connu une telle popularité au XVIIIe siècle, c’est en partie parce qu’elles sont l’aboutissement le plus parfait et le plus classique du style italien de l’époque. On rapportera à Charles Burney, lors de son séjour à Rome, que Corelli a passé trois ans à les réviser et à les corriger en vue de leur publication, et l’exemple de l’opus 6 suggère que certaines pièces remontent sans doute à ses débuts. Nous savons, grâce à son élève allemand Georg Muffat, que certains de ses concerti grossi existaient déjà en 1682. De même, au moins une de ses sonates pour violon a été composée avant 1679, date à laquelle il promet de l’envoyer à un membre de la Cour de Florence. Le fait que très peu de pièces dont l’authenticité n’est pas douteuse aient survécu, en dehors de celles figurant dans les recueils publiés, suggère qu’il ne laisse circuler que sa meilleure musique, publiée après maintes révisions. À en juger par les nombreuses imitations écrites par des compositeurs de l’Europe du Nord vers 1700, l’influence stylistique de Corelli s’exerce surtout sur le plan de l’harmonie. Ses sonates popularisent l’idée, révolutionnaire pour ses contemporains mais banale pour les générations suivantes, selon laquelle les modulations doivent procéder de manière logique vers des tonalités proches, comme la dominante ou le relatif mineur. Faute d’une telle organisation, la musique de chambre des meilleurs compositeurs allemands ou anglais de l’époque, comme Biber ou Purcell, donne par comparaison l’impression de n’aller nulle part et d’être brouillonne. Corelli montre aussi à ses contemporains qu’il est possible de moduler avec élégance grâce à des marches d’harmonie ascendantes ou descendantes sur des degrés conjoints, et que ces progressions forment un cadre idéal pour les traits de virtuosité. De manière tout aussi importante, il popularise le recours à des dissonances mordantes—généralement sous-tendues par une basse rapide, comme dans la fugue de la 1re Sonate ou dans le Tempo di Gavotta de la IXe Sonate—pour faire avancer le discours musical. Là encore, les compositeurs anglais et allemands n’ignorent rien des septièmes et des neuvièmes, mais ils tendent à les utiliser pour colorer la musique plutôt que comme élément moteur. Corelli est moins à l’avant-garde pour ce qui est de la forme. Les Sonates I à VI, souvent—mais trompeusement—appelées «sonates d’église», portent toujours les traces de l’organisation en «patchwork», à plusieurs sections, du début du XVIIe siècle. Toutes comportent au moins cinq sections principales, uniquement séparées par des doubles barres dans l’édition originale, et la 1re ne compte pas moins de dix changements d’allure en seulement six pages et demie de musique. Trois des «sonates de chambre», dans la deuxième partie du recueil—les VIIe, VIIIe et Xe—sont de simples suites, enchaînant trois ou quatre danses à un prélude «abstrait»; elles ont sans doute été écrites avant la IXe, qui comprend un Adagio chromatique entre la Giga et le Tempo di Gavotta, et avant la XIe, probablement la dernière du recueil à avoir été composée, qui ne comporte qu’une danse explicitement dénommée, la Gavotta finale. La XIIe Sonate, la célèbre «Follia» ou «La Folia», se rattache à une tradition de variations pour violon sur des progressions d’accords qui remonte à la génération de Salamone Rossi et de Biagio Marini. Elle trouve son origine dans une danse espagnole échevelée du XVIe siècle et s’apparente à la basse contrainte de la Renaissance «La Gamba», identique à «La Folia» à l’exception du premier accord. Les versions qu’en donneront par la suite des compositeurs allant de Vivaldi à Rachmaninov seront presque toutes inspirées de Corelli. Une des raisons essentielles de la popularité jamais démentie de l’opus 5 de Corelli est qu’il était de tradition de l’utiliser comme point de départ d’ornementations improvisées ou écrites. Pour mes informations en la matière, je suis redevable à Neal Zaslaw, qui prépare une édition des recueils d’ornementation subsistants. Le plus célèbre, réunissant des versions ornées des mouvements lents des Sonates I à VI, a été publié à Amsterdam en 1710 par l’éditeur Roger, qui les présente comme «les agréments des adagios […] composés par M. A. Corelli, comme il les joue». Certains musiciens doutant de leur authenticité (l’écrivain anglais Roger North s’étonne qu’«autant de vermine ait pu s’insinuer dans l’œuvre d’un tel maître»), Roger répond en 1716 par une annonce dans laquelle il propose de montrer, à quiconque le souhaite, «l’original de M. Corelli, avec ses lettres écrites à ce sujet». Les avis sur leurs mérites ont depuis lors été partagés, mais ces agréments sont certainement ce qu’on aurait pu attendre d’un bon violoniste italien de l’époque, et le présent enregistrement s’en inspire largement. Par la suite, des violonistes-compositeurs allant de Geminiani (élève de Corelli) à Francesco Galeazzi (1758–1819) ont écrit des versions encore plus élaborées, et certains ont commencé à composer des variations sur les mouvements rapides des Sonates I à VI et sur de nombreux mouvements des Sonates VII à XI. Nous en entendons ici deux exemples. Les reprises ornementées du Preludio de la IXe Sonate proviennent d’une source anglaise datant probablement des années 1730 ou 1740 (Bibliothèque de l’Université de Cambridge, Add MS 7059), tandis que la IXe Sonate est reprise dans son intégralité dans la version élaborée de Geminiani, reproduite par Sir John Hawkins dans sa General History of the Science and Practice of Music (Londres, 1776). Hawkins précise qu’elle est notée «telle que Geminiani avait l’habitude de la jouer, et copiée à partir d’un manuscrit de sa propre main», ajoutant que c’est «le meilleur exemple qui puisse être donné de son style d’exécution». Arcangelo Corelli wurde am 17. Februar 1653 als jüngstes Kind eines wohlhabenden Grundbesitzers in Fusignano geboren. Seine musikalische Ausbildung führte ihn zunächst in die regionalen Kleinstädte Faenza und Lugo und dann, als er ungefähr dreizehn Jahre alt war, in die nahe gelegene Stadt Bologna—damals eines der bedeutendsten Zentren der Musik. Corelli lebte in Bologna, studierte Violine und Komposition, bis er etwa zwanzig war, und ließ sich dann offenbar in Rom nieder. Corellis Aufstieg im römischen Musikbetrieb verlief rasch. Um 1679 spielte er eine wichtige Rolle in Kirchenorchestern, die zu bestimmten Anlässen aufgestellt wurden, und stand im Dienst der glanzvollsten Mäzenin der damaligen Zeit, der im Exil lebenden Königin Christina von Schweden. Soweit bekannt verbrachte Corelli sein ganzes Berufsleben in Rom, obwohl im achtzehnten Jahrhundert Geschichten im Umlauf waren, er habe Deutschland, Frankreich, Spanien, ja sogar England bereist. Corelli war ab den 1680er-Jahren in Nordeuropa äußerst einflussreich, was jedoch fast ausschließlich auf seine veröffentlichten Sammlungen zurückzuführen war; seine Triosonaten Op. 2, 3 und 4 kamen nacheinander in den Jahren 1685, 1689 und 1694 heraus, gefolgt von den hier vertretenen Stücken, den Sonate a violino e violone o cimbalo Op. 5 im Jahr 1700. Seine letzte Sammlung, die Concerti Grossi Op. 6, erschien 1714 in Amsterdam. Corelli starb am 8. Januar 1713 in Rom und wurde im Pantheon beigesetzt. Corelli nimmt in der Geschichte der westlichen Musik eine Schlüsselstellung ein, nicht zuletzt deshalb, weil er der erste Komponist war, dessen Hauptwerke nie aus dem Repertoire verschwunden sind (und darum auch nicht neu entdeckt werden mussten); seit ihrem ersten Erscheinen sind sie durchweg in Druckausgaben erhältlich. Opus 1 bis 6 wurden im achtzehnten und frühen neunzehnten Jahrhundert in immer minderwertigeren Fassungen nachgedruckt, bis Joachim und Chrysander 1871 die Gesammelten Werke herausgaben, die erste wissenschaftlich fundierte moderne Ausgabe. Opus 5 war zweifellos die populärste von Corellis Sammlungen. Sie wurde im achtzehnten Jahrhundert in zehn europäischen Städten über fünfzigmal nachgedruckt, und Stücke daraus tauchten in vielerlei Gestalt auf, von einfachen Arrangements für Tasteninstrument und Blockflöte bis hin zu Geminianis Concerto-grosso-Bearbeitungen. Correllis Sonaten erlangten ihre ungeheure Popularität im achtzehnten Jahrhundert unter anderem deshalb, weil sie den italienischen Stil seiner Zeit in der geschliffensten, reinsten Form zu Gehör brachten. Anlässlich seines Besuchs in Rom berichtete man dem Musikforscher Charles Burney, Corelli habe drei Jahre darauf verwandt, sie für die Druckausgabe zu überarbeiten und zu redigieren, und im Falle von Opus 6 liegt nahe, dass er einige der Stücke schon in seiner Jugend komponiert hatte. Von seinem deutschen Schüler Georg Muffat erfahren wir, dass mehrere Concerti grossi schon 1682 vorgelegen haben. Auch mindestens eine Violinsonate hatte Corelli schon 1679 komponiert: Damals versprach er einem Angehörigen des florentinischen Hofs, sie ihm zu schicken. Die Tatsache, dass außerhalb der gedruckten Sammlungen so wenig verbürgte Musik von Corelli erhalten ist, lässt vermuten, dass er besonderen Wert darauf legte, nur seine beste Musik in Umlauf zu bringen, und sie erst nach wiederholter Überarbeitung freigab. Den zahlreichen Nachahmungen nach zu schließen, die nordeuropäische Komponisten um 1700 verfasst haben, war das einflussreichste Element von Corellis Stil seine Harmonik. Seine Sonaten brachten die damals revolutionäre, für spätere Generationen dagegen selbstverständliche Idee, dass Sätze nach einem logischen Schema in eng verwandte Tonarten wie die Dominante und die Paralleltonart zu modulieren haben, breiteren Kreisen nahe. Corelli zeigte seinen Zeitgenossen auch, dass Modulationen mittels stufenweise auf- und absteigender Sequenzen auf elegante Art herzustellen sind, und dass Sequenzen den idealen Rahmen für virtuose Läufe darstellen. Ebenso wichtig ist, dass er die Verwendung scharfer Dissonanzen popularisiert hat; er setzte sie ein, um die Musik voranzutreiben, und zwar typischerweise über einem durchlaufenden Bass wie in der Fuge der Sonate Nr. 1 oder im Tempo di Gavotta der Sonate Nr. 9. Auch englische und deutsche Komponisten waren mit Septimen und Nonen vertraut, neigten jedoch dazu, sie zur Nuancierung der Musik anstatt dafür einzusetzen, um ihr Richtung zu verleihen. Weniger vorausschauend war Corelli in Fragen der Form. Die Sonaten Nr. 1 bis 6, die gemeinhin, aber irreführend als „Kirchensonaten“ bezeichnet werden, weisen noch Spuren der aus vielen Einzelteilen bestehenden, „zusammengestückelten“ Formen des frühen siebzehnten Jahrhunderts auf. Alle haben sie mindestens fünf große Abschnitte, die in der Erstausgabe nur durch doppelte Taktstriche getrennt sind, und die Nr. 1 sieht auf ganzen sechseinhalb Seiten Musik nicht weniger als zehn Tempowechsel vor. Drei der so genannten „Kammersonaten“ im zweiten Teil der Sammlung—Nr. 7, 8 und 10—sind schlichte Suiten mit drei bis vier Tänzen im Anschluss an ein „abstraktes“ Präludium; sie sind vermutlich älteren Datums als die Nr. 9 (mit ihrem chromatischen Adagio zwischen Giga und Tempo di Gavotta) und die Nr. 11, die als letztes Stück der Sammlung komponiert worden sein könnte, mit nur einem namentlich genannten Tanz, einer abschließenden Gavotta. Die Sonate Nr. 12, die berühmte „Follia“ bzw. „La Folia“, gehört in die Tradition der Violinvariation über Akkordfortschreitungen, die bis in die Generation von Salamone Rossi und Biagio Marini zurückreicht. Ihr Ursprung war ein temperamentvoller spanischer Tanz des sechzehnten Jahrhunderts, und sie ist mit dem Basso ostinato „La Gamba“ aus der Renaissance verwandt—der nämlich ist im Grunde „La Folia“ abzüglich des ersten Akkords. Spätere Bearbeitungen des Themas durch Komponisten, die von Vivaldi bis hin zu Rachmaninow reichen, ließen sich nahezu alle von Corelli inspirieren. Ein wesentliches Element der anhaltenden Popularität von Corellis Op. 5 war die Tradition, die Musik daraus als Vehikel für improvisierte oder ausgeschriebene Verzierungen zu nutzen. Für die hierzu gelieferten Informationen bin ich Neal Zaslaw zu Dank verpflichtet, der zurzeit eine Ausgabe der erhaltenen Verzierungen vorbereitet. Die bekanntesten—ausgezierte Versionen der langsamen Sätze der Sonaten Nr. 1 bis 6—erschienen 1710 in Amsterdam; der Verleger Roger stellte damals die Behauptung auf, sie seien „von einem Herr A. Corelli beim Spielen komponiert“. Manche Musiker äußerten Zweifel an ihrer Authentizität (der englische Autor Roger North fragte sich, wie „so viel Ungeziefer in das Werk eines solchen Meisters hineingekrochen“ sein konnte), worauf sich Roger in einer 1716 erschienenen Anzeige erbot, „Herrn Corellis Original und seine zu diesem Thema verfassten Briefe“ jedem zu zeigen, der sie sehen wolle. Die Ansichten über ihren Wert sind bis heute geteilt, aber sie könnten auf jeden Fall von einem guten italienischen Violinisten der damaligen Zeit so gespielt worden sein, und wurden in der vorliegenden Einspielung größtenteils übernommen. Spätere Violinisten und Komponisten von Geminiani (einem Corelli-Schüler) bis Francesco Galeazzi (1758–1819) haben stets kunstvollere Fassungen erstellt, und einige fingen an, Vaiationen über die schnellen Sätze der Sonaten Nr. 1 bis 6 und viele Sätze aus den Sonaten Nr. 7 bis 11 zu schreiben. Zwei Beispiele sind hier zu hören. Die verzierten Wiederholungen des Preludio der Sonate Nr. 9 entstammen einem in der Universitätsbibliothek von Cambridge verwahrten Manuskript (Add MS 7059), einer englischen Quelle wahrscheinlich aus den 1730er- oder 1740er-Jahren, und wiederholt wird die Sonate Nr. 9 in ihrer Gesamtheit in der vollständig ausgezierten Fassung von Geminiani, die in Sir John Hawkins’ General History of the Science and Practice of Music (London, 1776) enthalten war. Hawkins berichtet dazu, sie sei niedergeschrieben, „wie Geminiani sie zu spielen pflegte, und aus einem in seiner Handschrift abgefassten Manuskript herauskopiert“; er fügt hinzu, sie sei „das beste Beispiel, das man für den Stil und die Art und Weise seines [Geminianis] Vortrags geben kann“.